Do you have an interview coming up? Are you scheduled to give a speech? Do your grown children want a family photo for the holidays? 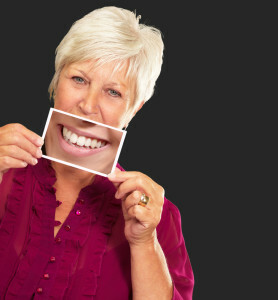 Are you fretting because you don’t have time for a smile make-over? Don’t worry. If you need a great smile fast just snap it on! Snap-on smiles do exist, and they are called just that, the Snap-On Smile because they simply snap into place. If you’re going out for a night on the town with friends, or whatever the reason, keeping the Snap-On Smile handy may be the answer for you. The Snap-On Smile is an easy and non-invasive way to transform your smile and can be used in cases that involve missing teeth, stained teeth, crooked teeth, teeth with spaces, chipped teeth, and teeth that have been worn down. With the snap-on there is no need to remove existing tooth structure, there is no need for anesthesia, and for those concerned with expense, the Snap-On Smile can be a less expensive option than dental veneers. Fabricated from a flexible plastic resin material, the prosthetic fits over your dental arch and is held in place via the contouring to your natural smile. To customize your smile, an impression of your natural arch is made. Next, your dentist will help you choose the shape and color of your teeth so your smile will look as natural as your real smile. Then, the impressions and additional information is sent to a special lab where your new smile is fabricated. During the second visit your new smile will be tried-on and you can walk out of the office with a great smile.